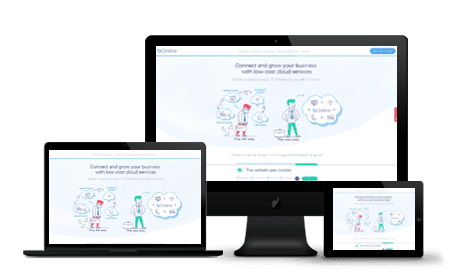 bOnline is a company focused on providing modern online solutions for small and medium-sized businesses. One of their specialties is their cloud-based VoIP solution that is trusted by many as a reliable, affordable, and efficient means of business communication. This business package costs £9 a month and gives you 100 minutes which can be used to call both UK landlines and mobile phones and you get all the telephony features. By paying an additional £2, you can get full mobility, by adding another £8, you get to call 500 countries including Australia, Belgium, Denmark and Canada. Rated as the most popular package, the business 1200 costs £13 a month and provides you with 1200 UK landline and mobile minutes. It comes with all the basic features, full mobility and you can get the international calling package for an additional monthly fee of £3.25. This package is priced at £16 monthly and it allows you to make unlimited calls to certain service providers (conditions apply). The rest of this package is exactly similar to the business 1200; you get the international calling package for an additional £3.25 every month. The best part about bOnline’s VoIP solution has to be that there is no need to install any software on your machines, or to set up any hardware on your premises. The whole platform is completely online and you can use one number across all your device. It doesn’t matter whether you currently have access to your laptop, tablet or mobile. With bOnline you are always connected. You can access all of the application features on the go without having to maintain different numbers on different devices. bOnline is one of the richest VoIP solutions when it comes to telephony features. These include group calling, auto-attendant, internal calling, music on hold, voicemail, enterprise phone directory, push-to-talk, shared call appearance, outbound caller ID blocking, inbound fax, email to call return, N-Way calling, and anonymous call rejection, you get everything that should be found in a solid VoIP system. As the platform is completely based on the web, it’s really easy to set up. There is no need for any additional hardware and you don’t really need any additional IT help to get the solution up and running. However, the bOnline staff is available for any setup troubles. bOnline has more than the basics covered when it comes to support. They offer a live chat, FAQs, an online knowledge base, and a way to message them directly from their website, or by sending a personal email. There is also a phone complaint line open from Monday-Friday, 9am-5:30pm. They have generally gotten very positive reviews for their professional, UK-based customer service. Most customers reported flexible, friendly, helpful staff able to resolve issues quickly. Phone support is available Monday-Friday 9am-6pm, Saturday 10am-2pm. Chat support is available Monday-Friday 9am-6pm, Saturday 10am-2pm. Customer service can be contacted via email. A FAQ is available but it only contains billing FAQs. More information on other topics can be found in the "advice and answers from the bOnline Team" section. A blog is available with news, tips, and insights. bOnline is a very dependable VoIP solution which is ideal for small and medium-sized companies. It comes with a rich set of features and is completely based in the cloud so there is no need to install any hardware or schedule routine engineer visits. Their pricing policies are also very kind to the customer which makes it hard for competitors to keep up with them.